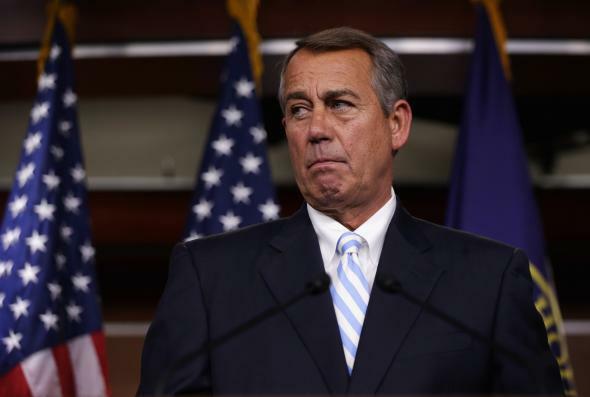 DHS-shutdown watch: House GOP revolts, blocks John Boehner's bid to avoid partial DHS shutdown. House Speaker John Boehner began Friday thinking he may have found a way out of the political stalemate that threatened to partially shutdown the Department of Homeland Security at midnight. His proposed solution—a three-week funding bill that would have set up a repeat of the same immigration fight next month—ended in an unexpected and embarrassing defeat Friday evening when he couldn’t wrangle enough of his party’s rank-and-file to vote for his stopgap measure. GOP leaders held the vote open for more than a half hour as they frantically tried to convince enough conservatives to change their minds, but the measure ultimately failed 203-224. It needed 217 votes for passage. Democrats, at the urging of Minority Leader Nancy Pelosi, largely voted against the effort. That left conservative lawmakers to either side with GOP leadership or risk a partial shutdown of a federal agency that includes the Secret Service, TSA, FEMA, and Coast Guard. In the end, roughly 50 Republicans opted for the second of those two options. The lower chamber remains in session, though, so it’s possible that the House could still vote again before midnight. Politico’s John Bresnahan is reporting that one option on the table would be to bring up an even shorter funding bill. After what just happened on the House floor, however, there’s little to suggest the conservatives who have pushed DHS to the brink of a partial shutdown would be willing to budge now. Earlier in the day, the Senate Republicans passed a standalone bill to fund DHS for the remainder of the fiscal year. That effort was step one of Majority Leader Mitch McConnell’s two-part plan, which also includes a standalone vote on legislation to block President Obama’s immigration reforms. GOP hardliners in the House have no interest in that plan, however, and appear steadfast in their desire to tie the department’s funding directly to reform-blocking legislation. If the House would have passed its three-week bill this evening, the Senate was ready to sign off on it. If DHS funding does expire at midnight Friday, the agency will actually shut down largely in name only. A fraction of the department’s staff would be furloughed, but by law the department’s essential employees would be required to keep working, albeit in many cases without a paycheck. As I explained earlier this week, though, the irony of the situation is that if DHS funding does expire, it won’t specifically undercut Obama’s immigration reforms (which are self-funded by application fees) but it will harm a handful of programs that have traditionally been Republican favorites. Regardless, the more immediate damage the stalemate and any shutdown would inflict appears likely to be on the working relationship of GOP hardliners and their party’s more moderate leadership.